The brain and neuroscience field is a life science highly anticipated to show rapid advancements within the 21st century. The maintenance of good brain health is expected to improve the quality of life (QOL) within the current aging population. In addition, innovative information and communications technologies (ICT) can be created by applying the same information processing mechanisms as discovered in the brain. Therefore, the field has had high expectation from both society and industry. computational algorithms of the brain have yet to be completely elucidated. 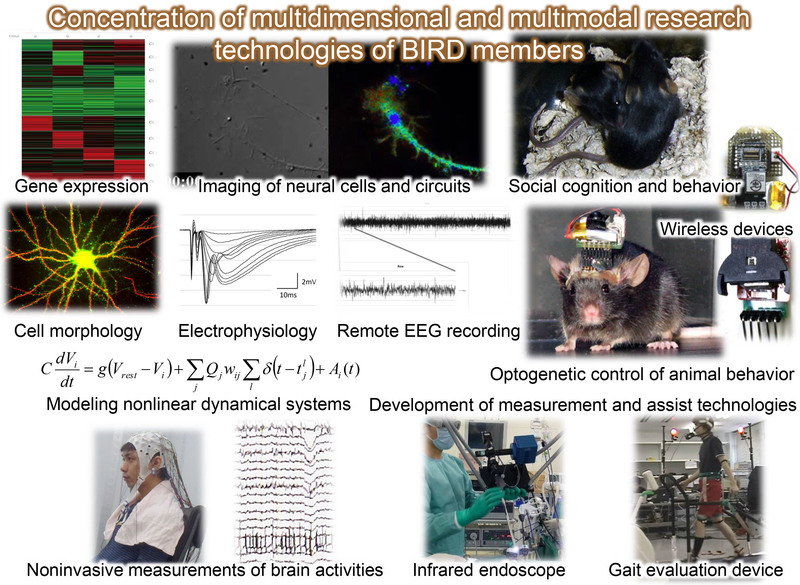 In order to unravel the complex details of the brain that controls human thought and action, and thus apply this knowledge to emergent development, multi-scaled, multimodal and multidimensional research approaches are required. Informatics that allows such integration becomes essential, and thus the focus and cooperation between the various interdisciplinary fields is also vital. In our University, multimodal and multidimensional research is being advanced within a wide range of fields spanning the natural science, engineering, pharmaceutical and medical sciences. 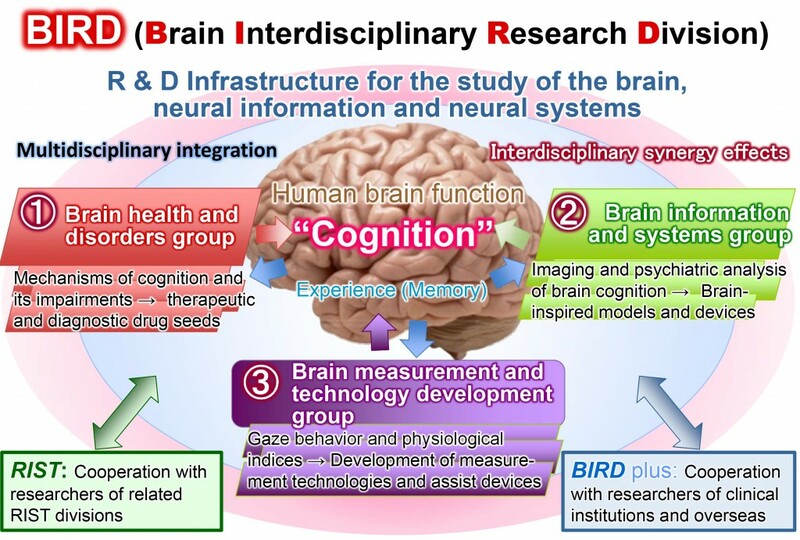 The Brain Interdisciplinary Research Division (BIRD) is creating a research and development (R&D) infrastructure allowing for effective collaboration between researchers belonging to the various disciplines distributed throughout the University (e.g. experimental, information, system and developmental courses). By capitalizing the synergism in this collaborative environment, we aim to create some revolutionary results – filled with the creativity afforded by multidisciplinary integration – regarding the brain, neural information or neural system from Tokyo University of Science. With a focus on cognition, this group aims to elucidate the mechanisms of brain health and disorders (e.g. depression with pessimistic cognitive characteristics; senile dementia that reduces cognitive and memory function; social cognition and communication difficulties caused by autism) and develop therapeutic and diagnostic drug seeds. This will be achieved through multidimensional research studies all aspects from the molecular and neural circuitry to model animals. This group aims to elucidate, model and theorize the brain information processing systems with a focus on human visual perception. The group aims to achieve these goals through multidisciplinary studies including brain function imaging, cognitive psychological experiments and brain algorithms. This group aims to develop measurement and evaluation technologies of brain function and impairment and their assist devices through multidisciplinary study of movement such as gaze behavior and locomotion as well as personality traits and physiological indices which reflect the internal state of the brain. Using the emergent research infrastructure created by multidisciplinary integration, we aim to establish an R & D base for brain health, brain measurement, modeling, and for the creation of new devices with designs inspired by the brain function. Healthy brain function is essential for a richness of mind and a better quality of life. In our modern society of high stress and aging communities, the preservation of a healthy brain is becoming evermore important. Furthermore, the brain is a living energy-saving device that can massively parallel processes, learn, store and retrieve a myriad of information by itself. Therefore, we can expect creation of future technologies and devices inspired by the study of the brain.